Ralf Kesper (Fröndenberg, Germany) on 14 April 2019 in Architecture and Portfolio. 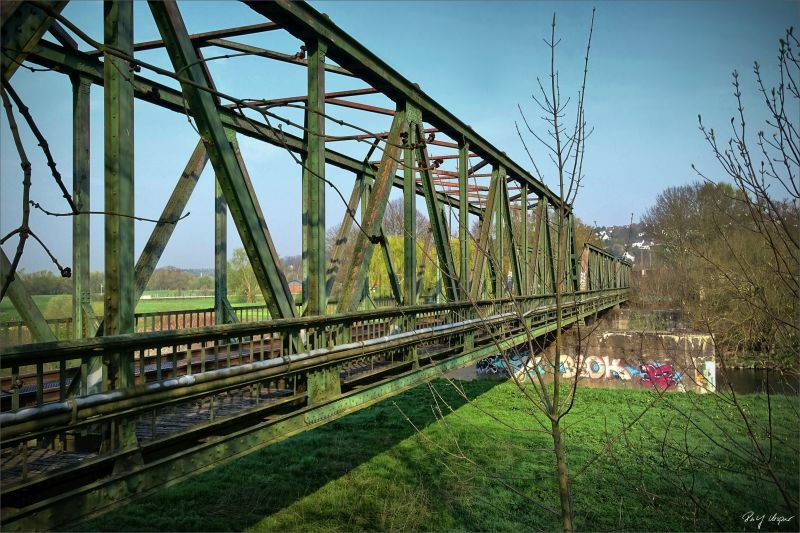 Other side of the old railwaybridge in Fröndenberg. The right side here was destroyed in the war by a fleetwave after the dambuster raid of the British airforce against the Möhnelake 1943. It's almost art. It is so old that it belongs to the landscape. Nice depth in the picture, through the bridge and the trees in the foreground. A good graphic perspective ! Beautiful image..Green vegetation here...under the bridge !!! Lovely point of view and I like the patina. I'm a Lover of these old realisations,more when they have a particular story ....Always up,against winds and tides .........Nice reporter's picture,Ralf . Good prespective of this bridge! Thanks to the well-chosen composition, a nice depth has been created here. La perspective hautement symbolique d'un pont! It blends right in with all of the green. A lot of history here with this old bridge. It's amazing the left side survived the attack. Awesome bridge! Excellent point of view! spring is about to happen! Interesting history Ralf, thank you. Belle diagonale qui dirige notre regard vers le tag. The graffiti seems to belong there ... great match with the rusty green tones! Une belle perspective et composition teintées de vert!